The Model 2 System is designed for pipe sizes 2 inches to 8 inches. This system includes the PT-107Transmitter, especially designed to fit poly (foam) and urethane pigs. 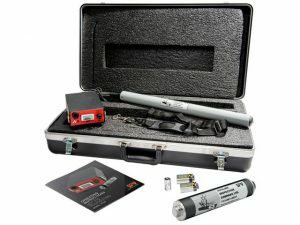 The PT-107 transmitter negotiates line sizes of 2 inches to 8 inches. Not suited for metal body pigs.